The departure of Bill Berry in 1997 is R.E.M.’s obvious pivot point, splitting the band’s history cleanly into two markedly different parts. This can be measured quantifiably, in terms of record sales: R.E.M. would never again go platinum in Berry’s absence, and in some cases the band sold fewer records than it did on IRS in the ’80s. It can also be heard on the albums themselves, particularly the trilogy that came out in the late ’90s and early ’00s: 1998’s Up, 2001’s Reveal, and 2004’s Around The Sun. Before these albums, R.E.M. prided itself on being a self-contained unit, occasionally bringing in adjunct musicians but never letting them overshadow what the core four members brought to the whole. During this period, however, R.E.M. relied on outsiders to an unprecedented degree, letting them compensate for the indecisiveness or (worse) disinterest of R.E.M. proper. The result is music of varying quality that sounds little like the band’s “classic” period—sometimes for good, but often for not. By all accounts, Berry’s decision devastated his former bandmates, though the full extent of the damage his exit inflicted on R.E.M. wouldn’t be apparent until a decade later, after the band’s image and critical reputation had been greatly diminished from the highs of the early ’90s. New R.E.M. albums stopped being treated as events by the press; not only did they not sell well, but the “post-Berry” trilogy was largely ignored by the very same people who had charted and praised R.E.M.’s every artistic development just a few years earlier. In retrospect, these albums aren’t wholly deserving of their reputation. I’d even make a case for one of them, Up, being a flawed near-masterpiece, and worthy of being included in the vaunted company of the band’s other ’90s albums. But even at its best, R.E.M.’s music during the period is challenging, a little slow, and difficult to access emotionally; it doesn’t rock, in other words. R.E.M. was still capable of writing strong hooks and breathtakingly beautiful melodies, and the move away from guitar-based arrangements and toward pocket symphonies composed of vintage keyboards and mechanical rhythms was a boldly radical reinvention. If R.E.M. was no longer going to sell millions of albums, the band members seemed content to abandon commerciality altogether in favor of following its idiosyncratic muse. R.E.M. still had the resolve to be a creatively vital entity; it just didn’t always have the inspiration or the energy. Following R.E.M. at this time was like watching a sick patient trying to get out of bed and walk. It could be painful to observe. More than anything else, Berry mattered as a member of R.E.M. because he always had been a member of R.E.M. Stipe referred to R.E.M. without Berry as a three-legged dog, a creature that exists only by some misfortune of nature. Losing a limb for R.E.M. meant learning to walk again (which could be done) and spending the rest of its existence appearing to be incomplete in some crucial way (which could never be fixed). Mills made another analogy for R.E.M.’s partnership that he shared in a 1992 MTV Rockumentary episode: “R.E.M. to me is a marriage,” he said. “It’s a marriage in that there’s a great deal of love involved, both among ourselves and for what we do. It’s a marriage in that you have to work at it.” R.E.M. was not a marriage in the sense that one person splitting necessitated a divorce; as tense as inter-band relations got during sessions for the first post-Berry record, Up, the remaining members of R.E.M. appear to have been relatively secure about their desire to stay together. And Berry himself insisted that R.E.M not break up just because he was leaving. Stipe seems to have taken Berry’s leaving the hardest of all, falling into a deep depression that Buckley describes in R.E.M. Fiction as “an emotional black hole.” Stipe’s mental state lead to a serious case of writer’s block during the Up sessions; according to Buck, Mills also “just wasn’t focused” during the album’s long, hard gestation period, which started in January 1998 and carried on well into summer. Buck typically was the only one who bothered to show up to the studio on time to meet with the backing musicians R.E.M. hired to help record the album, which included drummer Joey Waronker, multi-instrumentalist Scott McCaughey, and percussionist Barrett Martin. Even with Buck burning the midnight oil to finish the album with hired hands and the other members of R.E.M whenever they bothered to come to work, Up still sounded incomplete when it was released in the fall of 1998. R.E.M. had only turned the album in to Warner Bros. in order to meet a deadline, and it’s been suggested that Up might never have been finished if it had been solely up to the band. Another obvious influence on Up, appropriately enough considering the band’s melancholy state of mind, was The Beach Boys’ Pet Sounds. The pretty piano ballad “At My Most Beautiful” is the most obvious Brian Wilson homage, but the lurching “Parakeet”—with its images of dead birds and babies struggling to breathe—is a whole other level of quiet, melodic desperation. In the chorus, Stipe asks to open the window; it’s not clear whether he wants a breath of fresh air or a ledge from which to hurl himself. But as always, it’s how Stipe sings these words that really matters: Up is his finest sustained vocal performance, with everything you need to know about the record heard plainly in his soft, battered voice. Just as Automatic For The People is R.E.M.’s death record, Up is an uncomfortably frank meditation on grief. 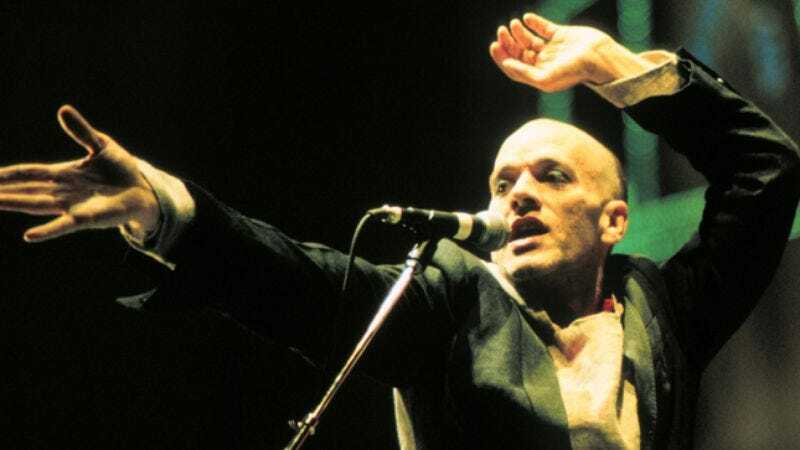 On Automatic, Stipe sings with the warmth and serenity of someone who has seen the other side and come to peace with it; on Up, there is no peace, only incomprehensible numbness and naked vulnerability. It was the unwitting sequel to New Adventures In Hi-Fi, a slow-motion survey of the wreckage the day after the fall. This is why Up is incomplete, because R.E.M. itself was incomplete. After Up, my connection to R.E.M. also began to erode. Reveal was the first R.E.M. album since I became a fan that I didn’t buy the week it came out; I didn’t buy it until a few months ago, when I started working on this series. Looking back, I’m not exactly sure why my interest dropped off so dramatically. It was partly due (I’m guessing) to having idealized R.E.M. beyond all reason. I had become convinced that this was a perfect band. The whole time I followed it, R.E.M. had never released anything less than fantastic. There was also the chemistry of the band members, and how they complemented each other in just the right ways. R.E.M. never seemed to do anything wrong. It made the right artistic decisions, it had the right politics, it was popular but not so ubiquitous that you got sick of it (as was true of Guns N’ Roses in the early ’90s), and it seemed like it could go on like that forever. And then Berry left, and R.E.M. became a different band that I didn’t like nearly as much as the old R.E.M. Over time, I started to feel a weird resentment about that. In the first part of Perfect Circle, I likened my relationship with R.E.M. to a marriage; it’s a different kind of marriage than what Mills describes, but it still suggests a level of commitment that over time builds bonds predicated on a set of expectations and emotional needs. As a fan, you get used to a band being a certain way; you get attached to sounds, lineups, production styles, album-cover typefaces, and whatever other little details get magnified in your mind. When these things change, your relationship changes. It’s like your spouse suddenly developing a serious drinking problem, or becoming a born-again Christian. The reality is that no artist is beholden to an audience’s desires, because those desires are so wide and disparate that satisfying them would be impossible. But in the mind of a fan, artistic whims or changes of life can feel like betrayals. Reveal is certainly a brighter, poppier, and more upbeat record than Up, and given that R.E.M. worked once again with producer Pat McCarthy and many of the same backing musicians, supporters might be inclined to look at Up as the rough draft for what became Reveal. It’s just not a view I happen to share. Up has plenty of flaws: It’s too long, it’s a little same-y, and it’ll pull you into a deep depression if you listen to it more than once at a time. But Up has a heft to it, a resonance, a feeling that R.E.M. bled a little in order to make it. I hate using this word to describe music, but Up is an honest record, almost to a fault. Reveal, however, takes the sound of Up and removes the guts. Reveal is gentle, meandering prettiness signifying nothing; it is the first truly empty R.E.M. record. The snappy single “Imitation Of Life” might have demonstrated that R.E.M.’s pop instincts were still intact (though the song stiffed on the charts, peaking at No. 83), but the band was retreating into studio technique and emotional constipation. Which brings us to the R.E.M. record nobody—least of all the band—likes, Around The Sun. Garnering some of the worst reviews and record sales of their career, Sun found R.E.M. so far removed from guitar-based rock music that it had drifted into limp Muzak with the potency of lukewarm water. Ten years earlier, R.E.M. made the loudest, most twisted music of its career with Monster; that album has many detractors, but only the most ardent contrarian would’ve preferred the flaccid listlessness of R.E.M.’s Around The Sun period. This is what R.E.M had been moving toward since Berry’s exit. Up and Reveal were reflections of a band in search of a new identity; those records had their share of hits and misses, but Around The Sun suggested that R.E.M.’s quest for a viable second act might ultimately be a failure. Disaffection and insecurity are the binding principles of this period, but on Sun, a palpable feeling of hopelessness entered the mix. As Buck later told Spin, “we had been stuck in this downward spiral for a while,” and Around The Sun was rock bottom. No, Around The Sun really isn’t really as bad as the Iraq war. But the comparison does sum up R.E.M.’s rudderlessness, a lack of direction and purpose so profound it had become difficult to support them. I had changed right along with R.E.M. in those years, and as a person suddenly in his mid-20s, I was also trying to figure out who I was. R.E.M. reminded me of a version of myself I no longer wanted to be. The new albums definitely weren’t worth my time, and I wasn’t interested in re-living my teen years by digging out the old albums. Frankly, I was sick of R.E.M., and ready to move on. Eventually, an old record I never liked very much brought me back to the fold, making what was overly familiar sound fresh again. But not before I attempted to sever ties with R.E.M. once and for all.